Two strategies to create a family money culture that empowers your kids without creating entitlement. As a Family Office, my team and I at First Affiliated work with families of considerable financial wealth. But as I describe in my book, True Family Wealth; Love, Money and an Inspired Life, financial wealth is not the same as True family wealth. True family wealth is achieved when every member of the family thrives. But that can’t happen when the family money culture is one of entitlement. As a family with financial resources, we raise our children in a life that expresses the gifts of those resources. They grow up living the good life on our dime. But that creates a challenge in good parenting. We want to raise our children to be independent, self -confident, empowered and contributors to society. We want them to have a good work ethic and express their unique talents in meaningful ways. And then when they are 16 they ask for a car so they can get to their new job. You have the resources to help, and the kids know it! How do you approach that conversation? What do you do? We want to help, but worry about creating entitlement. Here are two strategies you can use to create a family money culture that empowers your kids without creating entitlement. 1) Before you have those conversations, use an analogy I call the “The Rope, the Ladder or the Elevator” to define your boundaries and stick to them. Imagine your children at the bottom of a deep dark well. Without some help from those who went before, who now stand in the light at the top of the well (we hope), those at the bottom have little chance of climbing out on their own. So at the very least, we can throw them a rope (and a rope might be the only tool a family can afford at the time). A rope has some chance to get them out of the well, but their climb will still be pretty extreme, their hands a little bloody, their spirits somewhat deflated. Or, we can hand them a ladder. In both cases, they must still find their own personal power, develop their own strengths and capabilities, take risks, set goals, and work one step at a time to get to the top. If we can hand them a ladder though, they are more likely to get to the light faster and unhurt, grateful and energized to take on the next challenge life brings their way. It’s up to you to decide what makes the difference between a rope and a ladder. However, I do not advocate building them an elevator! No doubt they’d be lifted into the light with speed and comfort, but what have you done for them? You have taken away their personal power. They didn’t have to exercise and discover their own muscle. They didn’t learn to put one step in front of the other to reach a goal: it was just handed to them. They were robbed of the joy and satisfaction of a job well done. You have taken from them life purpose, which is really to create themselves. The adventure that self-discovery can bring was stolen from them. You eliminated opportunity for them to build their self-confidence. Plus, you would have expended great resources to build that elevator—and for what? A moment of ease and happiness, perhaps, but you eliminated their opportunity to develop their abilities, talents, and knowledge. Our impact will be one of empowerment (not dis-empowerment). We seek to use our resources in a sustainable yet expanding way. Decisions will consider the well-being of the group as well as the individual. We will do no harm. As a first step, might I suggest you describe the rope, ladder and elevator analogy to your kids and ask them which philosophy they feel you as a parent operate with. If the answer is all of the above, well, you have a little work to do clarifying and sticking to your boundaries. But at least the next time your sixteen -year old son asks you to buy him a car, you can tell him the elevator is out of service! Don’t make a New Year’s Resolution –make a plan!! 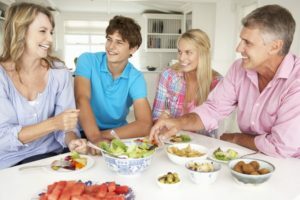 Building True Family Wealth: Creating family unity to discuss money and your legacy while avoiding conflict. Being “rich” means little if you do not feel “enriched”. Our Life Energy Quotient is the most important resource any of us has. ©Copyright 2018 Chris Clarke. All Rights Reserved.